Welcome to Week 25 of the One Yard Wonders Sew Along! Jacqui selected Moda Cross Weave Blue Tan. To make the circle for the top, Jacqui resorted to math. Out came the calculator and compass. She took the circumference of her head and divided that by 3.14 (Pi). Divided that number by 2. This gave her the length she needed to set the compass. For Jacqui it was 23 divided by 3.14 divided by 2 equals 3.66. She set her compass length just past 3 ½ inches (the radius) and proceeded to make a circle. Jacqui chose Moda Cross Weave Blue Tan because she felt it would go with most everything, as blog reader MarciaW pointed out. Moda Cross Weave looks the same on both sides so the hat would not be reversible. The Pink Chalk team came up with a few ideas for embellishments. 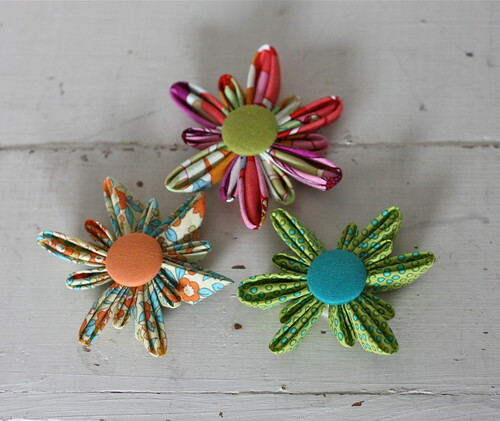 Fabric flower brooches sounded like fun! Kathy found a tutorial at the Gone To Earth Blog (http://gonetoearth.typepad.com/gonetoearth/2009/03/tutorial-fabric-flower-brooch.html) and the rest of the team helped pick fabric. We love the look of this origami style flower. The button centers were made using our new Pink Chalk Covered Button Kit. 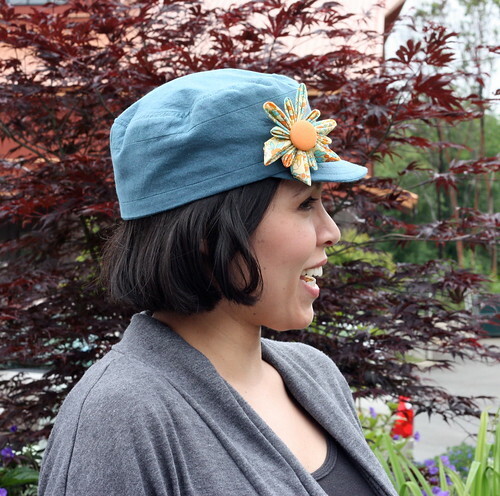 For the hat brim, Jacqui chose to use Pellon PelTex, an extra firm stabilizer instead of heavyweight interfacing. She trimmed off the seam allowances before fusing it. When she sewed the top circle, Jacqui divided the circle and the hat strips into 4 equal parts. She placed her pins in those 4 markings and added more pins in between as needed to help evenly sew the circle. 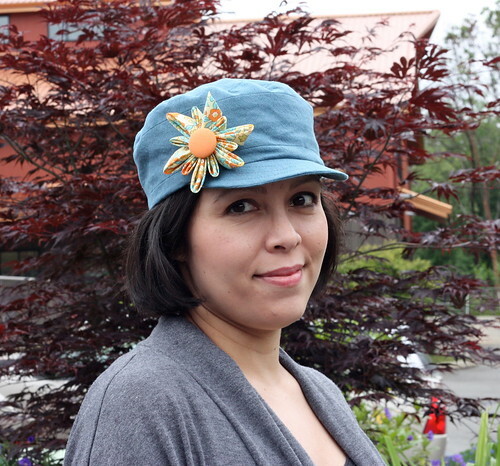 Jacqui opted to leave the top stitching off of the bottom of the hat but added it to the top. 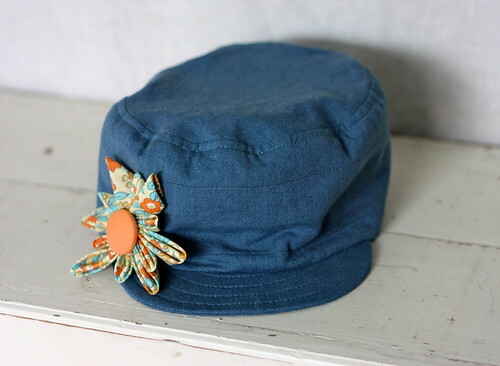 Because this hat is assembled with strips of fabric, She visualizes mixing and matching different prints. With right sides together and raw edges aligned, stitch one top band piece to one lining piece along the 11” edge. Repeat for the remaining top band and lining pieces. The Pink Chalk Team has been waiting and anticipating the bag section with much enthusiasm. 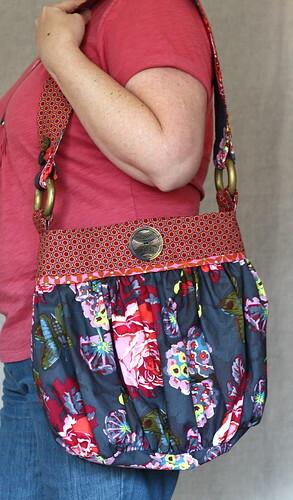 We all love to make and carry a fun bag. When making a bag, take time to think about its end use. Decide ahead of time if pockets are needed. Measure a favorite bag to make sure the size will work for your needs. 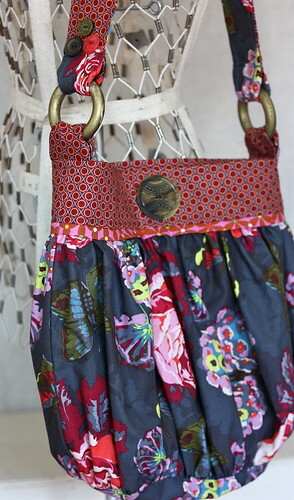 One yard of fabric will make this bag as pictured in the book. Layout your fabric exactly as pictured. The design uses every inch of fabric with no room for error. Diana used 3/4 yard for the exterior and 3/4 yard for the interior and top band. Structure is important in any bag construction. Think about the weight of fabric you’re using. 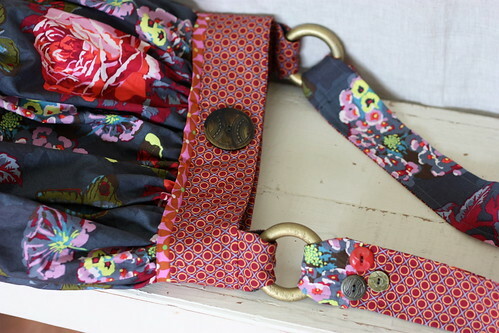 With that in mind, Diana added fusible interfacing to the lining, top band and straps. 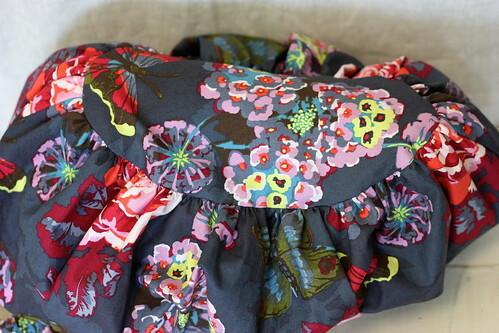 The interfacing will give the bag shape with out taking away from the gathered look. Diana made the flouncy bag 3 inches wider than the pattern. An easy adjustment to make. Just add 3 inches to each Top band and Lining piece. With this adjustment the bottom worked well at 4″ x 12″. The exterior measurement was left the same since there is plenty of room in gathers. In assembling the exterior Diana found it easier to attach the 2 top band pieces together as directed but don’t join into a circle. Attach the gathered exterior and stitch up the side. Then attach the bottom. Take your time and use lots of pins on the bottom. In assembling the interior. Leave an opening of 6 inches on one side. This allows for turning the bag right side out later. Finishing the bag – Use the directions on page 168, #6 Stitch the Lining to the Exterior. Making a bag sandwich is the easiest way to finish a bag. The best part is adding embellishments. Ribbon, buttons, flowers, beads… Go wild! Be creative and have fun!